Ensuring players have the proper equipment is key to keeping them safe and preventing injuries. This guide is intended for skaters, but detailed information on goalie equipment is available from InGoal Magazine (a great resource for all things goalie-related): Goalie gear for the beginner: How do you get started. 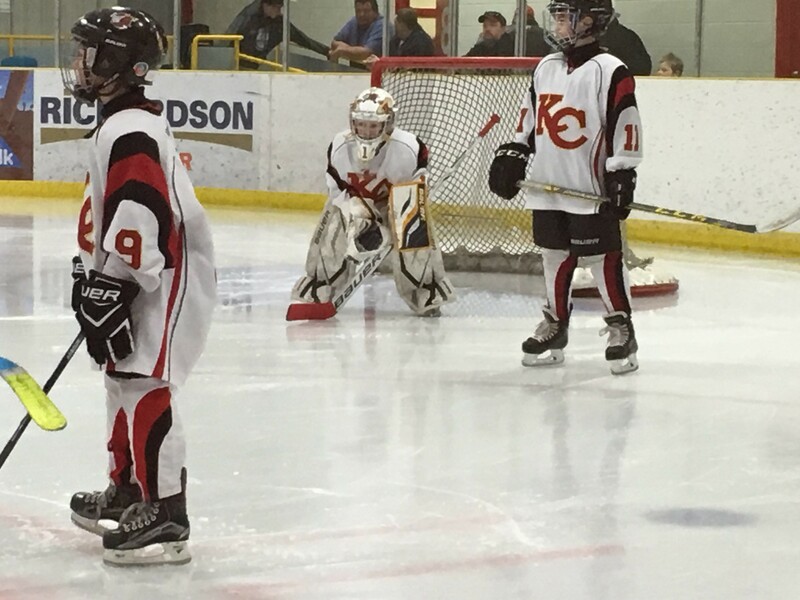 Goalie pads, gloves and chest protectors are available from KC for our goalies to use during the season – contact your local parish or the KC equipment managers for details. All goalie equipment available at the KC Equipment room is purchased from United Sport & Cycle. NOTE: All KC players are supplied game jerseys and game socks by KC Hockey. A detailed look at equipment tips is available in the Hockey Canada full Hockey Safety Guide (in PDF format). You should never buy skates that are too big to grow into as this can affect skating development. When drying your skates after a session the insoles should be taken out for more effective drying. Your helmet and facemask must be CSA certified. If you paint your helmet or remove the CSA sticker your helmet is no longer CSA certified. You should not apply stickers to the helmet as some stickers have glue that can harm the helmet and could effect both CSA certification and the manufacturers warranty. There are specific facial protectors for the player depending on their age, and you should ask your sports store or refer to the Hockey Canada rulebook to determine which is best for you. If you remove ear protection from your helmet it is no longer CSA certified and therefore does not meet Hockey Canada requirements. Your throat protector must be CSA certified and cannot be altered in any way. As a rule of thumb your hockey stick should reach between your chin and your mouth if you are in street shoes. In a “ready stance” with the stick’s blade flat on the ice, there should be no gap between the ice and the bottom edge of the blade? If so, try a different lie to remove this gap.